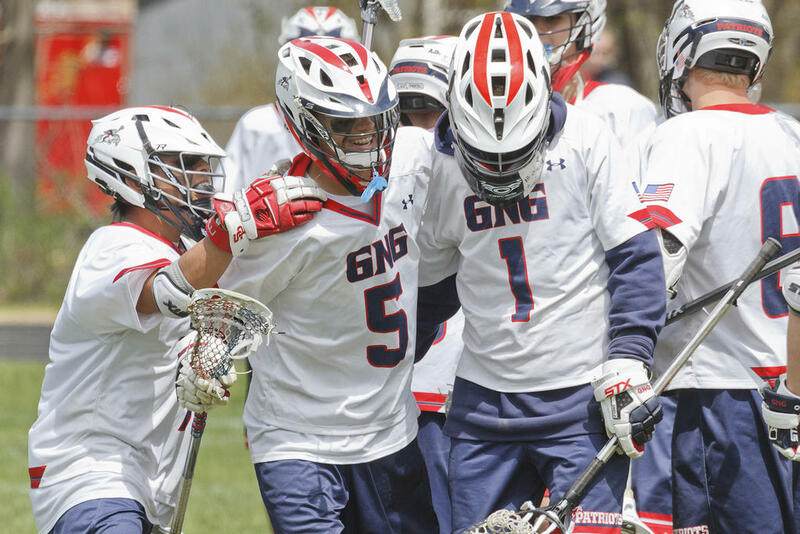 GRAY—The Patriots – Drew Lacerda led with five goals – picked up their biggest victory of the season on Saturday afternoon, May 12, when they toppled visiting Morse 13-6. G-NG grabbed an early lead, then spent the remainder of the game slowly pulling further and further ahead. The Patriots are in their first year as a varsity program, but they sure don’t look like it. G-NG’s fundamentals are obviously solid – at times, they’re even exceptional – and the team shows more lacrosse smarts than many outfits with much longer histories. G-NG jumped on top just 15 seconds into the outing, Lacerda launching a successful shot from the top-right of the Morse zone. The Shipbuilders answered with a long attacking stretch, but couldn’t capitalize. The Patriots then scooted ahead 2-0: Lacerda did the honors again, and from roughly the same spot as before. For the rest of the first quarter, the Shipbuilders hounded the Patriots. Morse responded to Lacerda’s strikes by getting on the board: With a Braden Olsen feed hot on his stick, Mason Savory underhanded the ball past Gilbert from low on the left side. The Patriots responded: Gabe Gendreau dashed up the middle and dished to Kyle Mercier high on the left side, Mercier shoveled across to Lacerda on the right and Lacerda pulled the trigger for 3-1. Early in the second quarter, Morse pulled back within one when Spencer Knowles scored on a Hudson assist from behind the G-NG cage. Morse threatened again soon – very soon, straight off the next faceoff. This time, Gilbert logged an impressive save. Throughout the contest, Gilbert stood stalwart, repelling several shots the Shipbuilders’ offense should’ve scored on. When an attacker penetrates the opposition’s back line and earns an undefended opportunity from eight or ten feet away – well, that’s usually a gimme goal. Not so with Gilbert between the pipes: He must’ve plucked at least a half-dozen of them clean out of the air. “I feel pretty decent,” Gilbert said of his performance. “A lot of that stuff is just doing what I normally do. I wasn’t necessarily changing anything according to how the other team was playing…When an it’s emotional situation, I like to take lead, and I like to get into it with the team. With 9:40 to play in the second, Patriot Trent Overcash bounced a shot from the top-right of G-NG’s offensive perimeter past Shipbuilders keeper Dylan Maybee for 4-2. Morse soon cut their deficit to one once more – Wyatt Hudson, battling at the low-right, bulldozed in close to Gilbert and punched a shot home – but after that, the Patriots gradually pulled away. Gendreau hashed a hat trick as the first half wound down, handing his boys a 7-3 advantage at the break. Hudson struck first in the third, though G-NG answered soon – and on arguably the most spectacular play of the day. Patriot Scott Lynch, cutting through the midfield, leapt and raised his stick one-handed into the air, somehow (!) reeling in a sky-high pass from his defense. Still carrying with just one hand and his stick extended, Lynch stumbled but somehow (!) recovered, turned and fed across to Mercier at the top of the Morse zone. Mercier fired quick, beating Maybee for 8-4. Two minutes later, at 6:29, Gendreau tallied his fourth, and Jeremy Mazur scored at 3:46. Up 10-5 to start the fourth, the Patriots added three more to the Shipbuilders’ one before the ending buzzer tolled. 13-6 the final. In addition to his five goals, Lacerda also added one assist. Gendreau had his hat trick and a pair of assists; Mercier two goals and two assists; and Overcash, Mazur and Jayden Metivier a goal apiece. Zach Durapu added three assists, Lynch two and Shayne Splint one. “We’ve got a lot of balance on our team,” Gendreau said, asked about the Patriots diverse attack. The win bumped No. 4 G-NG to 3-3 on the season. The Patriots dropped their first two games of the spring – 13-10 to No. 8 Wells (3-2) and 16-5 to No. 2 Fryeburg (8-0) – before notching their first-ever triumph as a varsity squad, 20-3 over St. Dom. St. Dom is struggling through a lackluster season – they’re ranked 15th at present, and are winless at 0-6 – but G-NG’s W marked a milestone nevertheless. The Patriots then dropped their third, 11-6 to No. 3 Lincoln (5-0), before winning their second, 7-6 over Lake Region, another program on the rise. G-NG rematches St. Dom on Wednesday the 16th, then travels to a tournament at Colby College on Friday the 18th. They host Oak Hill the following day. Morse slips to 5-4. The Shipbuilders sit in seventh place (in Class B) at the moment. They next host Oak Hill; that bout is slated for Thursday the 17th. The following Tuesday, they travel to Mt. Blue. G-NG’s Hunter Brown (5) celebrates alongside teammate Brannon Gilbert (1) just after the Patriots’ win over Morse. Patriot Trent Overcash crashes into Shipbuilder Alden Harkin in pursuit of a ground ball. Drew Lacerda tallied five goals for G-NG on Saturday. Brannon Gilbert stands guard at the G-NG net. Wyatt Edwards faces off with a Shipbuilder attacker. Patriot Gabe Gendreau drives forward on the attack, while Shipbuilder Ethan Pascuzzo does what he can to thwart Gendreau’s advance. Oliver Grant defends for G-NG. Shipbuilder Braden Olsen scurries forward on the attack, harangued by Patrtio Felipe Alvarez. Kyle Mercier flips the ball cross-field for the Patriots vs. visiting Morse. Hunter Brown unwinds into a shot for the Patriots. G-NG’s Zach Durapu clashes with Shipbuilder Alden Harkins. Kyle Mercier wheels away from a Shipbuilders opponent.